"No, everyone has to knit when they're here. I promise you. But not every person has to use yarn." As a single mom in her late 30s, Georgia has her hands full juggling the demands of running the Walker & Daughter knitting store with the challenges of raising her spunky teen daughter, Dakota. Georgia’s regular customers gather once a week to work on their latest projects and chat – and occasionally clash – about love, life, and everything else. 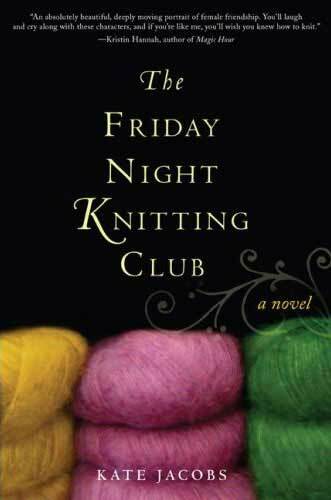 The members of the Friday Night Knitting Club are as varied as the skeins of yarn in the shop’s bins. There’s Peri, a pre-law student turned handbag designer; Anita, a silver-haired uptown matron; Darwin, a somewhat aloof grad student; K.C., an out-of-work editor looking for inspiration, and Lucie, a petite television producer with a few surprises up her sleeve. But soon their quiet Friday nights are shaken up: James, Georgia’s ex, wants to play a larger role in Dakota’s life – and possibly Georgia’s as well. Cat, a former high school friend, uneasily renews her bond with Georgia. And when the unthinkable happens, all of Georgia’s customers are forced to realize they’ve created not just a knitting club, but a sisterhood.